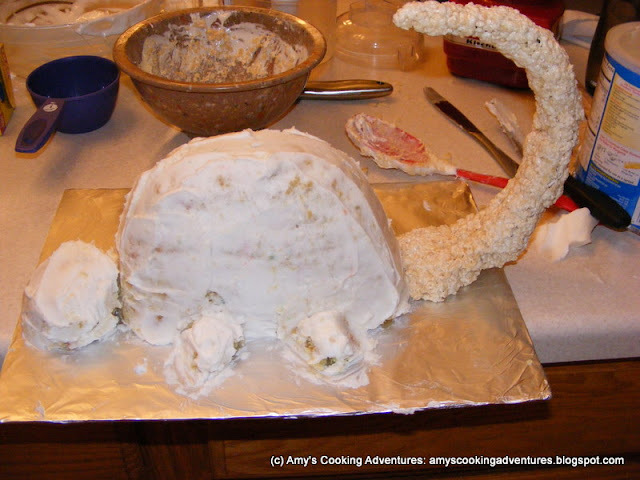 This post originally appeared on my first blog, Amy's Cooking Adventures in August 2011. For my son's birthday party this year, I was inspired by Threadcakes. A contest in which bakers can make and submit a cake based off a Threadless T-shirt design. 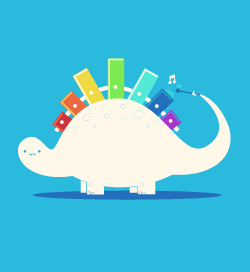 When I saw the Xylosaurus, I was in love! How cute and whimsical for my baby’s first birthday! This was my first sculptured cake, so I got to try several new techniques. 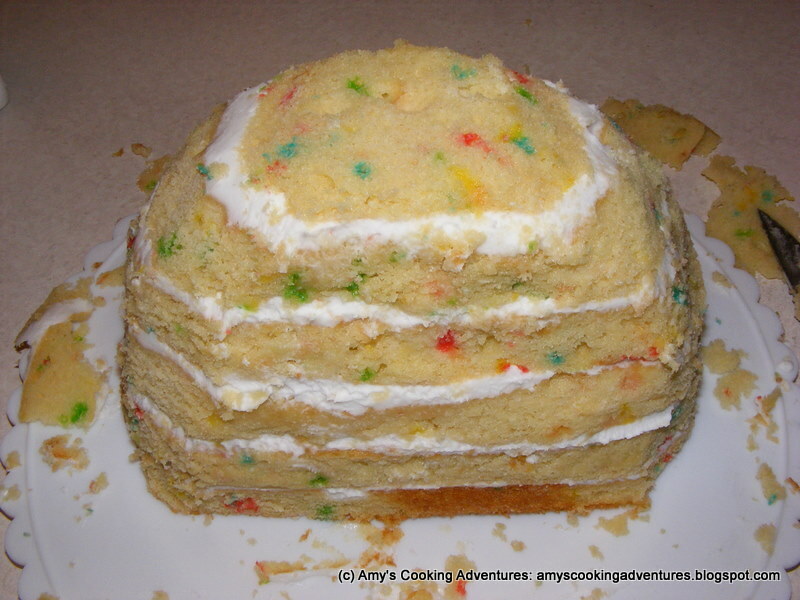 I started off with a Funfetti cake mix doctored up using this recipe. I baked it in two 9x13 pans at 375 degrees F, for about 25 minutes. Once cooled, the cakes were cut and stacked with butter cream in between the layers (sorry I forgot to take a picture of this step!) There were 6 layers, ranging from 4 ¼ inches wide to 2 ¾ inches wide. This was then wrapped carefully with plastic wrap (still on the cake board) and placed in the freezer overnight. 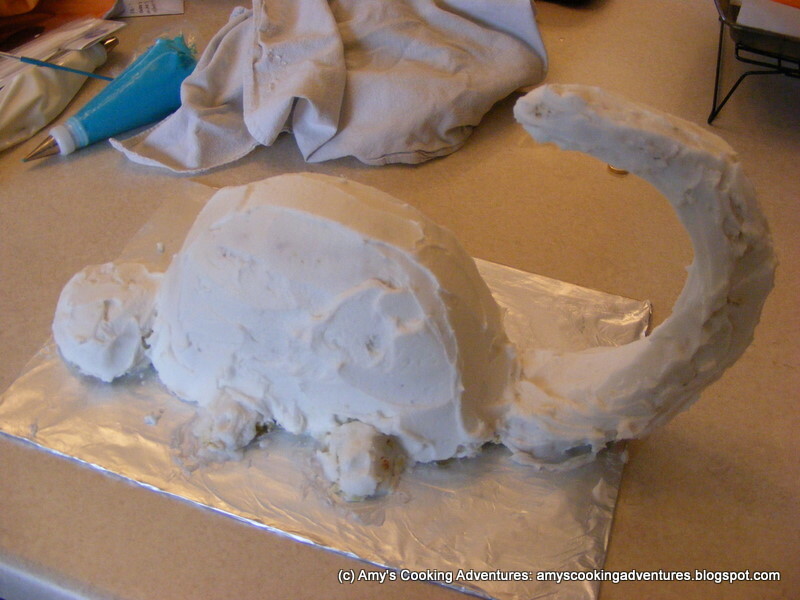 The next day, the cake was removed from the freezer and carved into the desired shape with a nice sharp knife. The scraps were used to fashion a ball for the head and four legs and thin layer of butter cream was applied as a crumb coating. Then the fun part started! 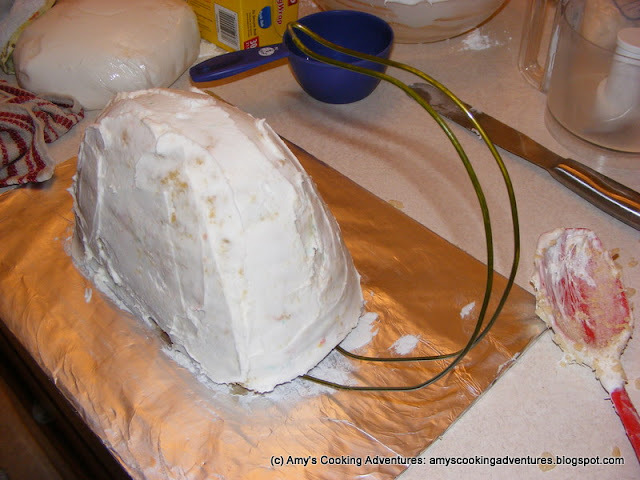 I had my husband bend a piece of wire (he actually used a clean wire hanger) into a tail shape that I could slide under the cake. I covered the wire in rice cereal treats to add some bulk. The day of the party, the whole cake got a thick layer of butter cream, including the nice, sturdy rice cereal treats tail! 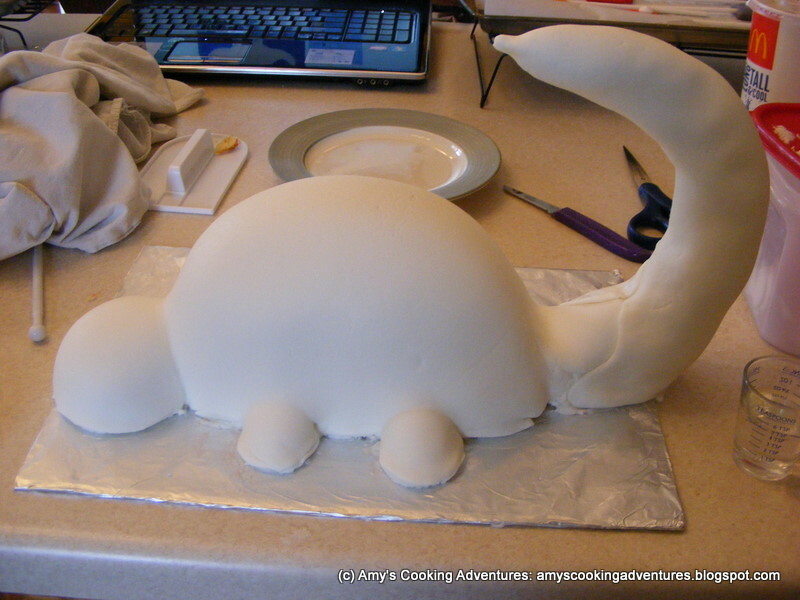 This was followed by a layer of fondant, and smoothed out. Then it was time for the final assembly! The cookie sticks were trimmed and inserted into the cake. I also made a small mallet from a left over end of a cookie stick and a ball of fondant. The final touches of the face and spots were added with an edible food marker and the transformation was complete! The cake was loved by all the party guests (kids and adults alike!) and I couldn’t have been more pleased with the results. Melt the marshmallows and butter together in 30 second incrememnts in the microwave. Stir the rice cereal into the melt marshmallows and apply to the cake form. How adorable! It looks like a lot of work, but work that was well worth it. Good job! This is very unique and fun. I would not have thought of using wire for the tail. Thanks for sharing - it made me smile this morning. oh wow!!! Such an amazing cake!! Love how it turned out, you did an amazing job! That is amazing. 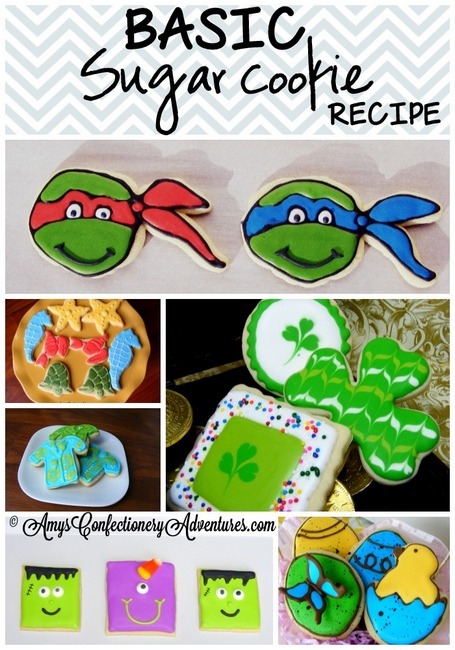 The fondant looks great! so cute. looks great. I love it. What a cute cake! I love it! I found you over on Chef in Training! This is truly amazing!!! How happy was your son??? Would love for you to share this at Saturday Share With Us! So cool! Love this! Pinning it! This has to be one of the cutest cakes I've ever seen! This is the most adorable cake ever! 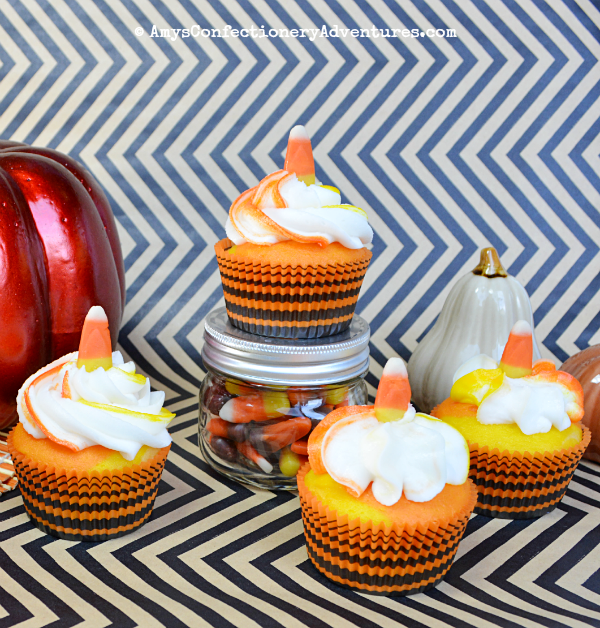 I could never make it, but I am pinning anyhow!